The most complete look at the CAC movement ever taken. 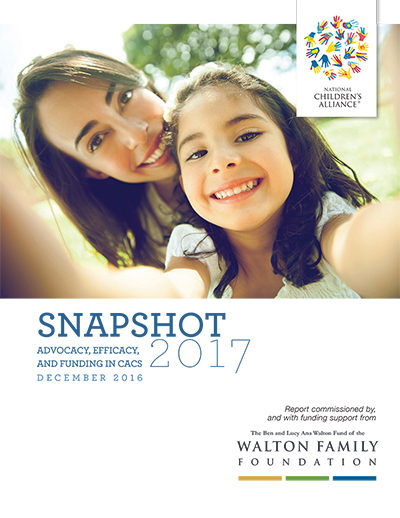 Snapshot 2017 is a report that provides data and primary information on how Children’s Advocacy Centers (CACs) are organized and funded, and identifies the key characteristics and attributes of high-performing CACs. This report was commissioned by the Ben and Lucy Ana Fund of the Walton Family Foundation and prepared by National Children’s Alliance. The report is intended to provide a range of informational sources and datasets collected from CACs across the United States and to compare national trends to those of CACs operating in individual states. Effective Organizational Characteristics & Practices. The report also includes custom data tables for CACs in all 50 states, including budget, funding sources, service delivery, and demographic information and more. Read yours now starting on page 32. With questions about getting involved with or finding assistance with legislative advocacy efforts in support of CACs, contact Denise Edwards, Director of Government Relations, at dedwards@nca-online.org. With questions about funding sustainability and private support for CACs, contact Bryan Boeskin, Senior Director of Development, at bboeskin@nca-online.org. With questions about census data and methodology, contact Kaitlin Lounsbury, Outcome Measurement System Coordinator, at OMSCoordinator@nca-online.org.